Ivor Armstrong Richards (February 26, 1893 – September 7, 1979) was an influential English literary critic and rhetorician. His books, especially The Meaning of Meaning, Principles of Literary Criticism, Practical Criticism, and The Philosophy of Rhetoric, were among the founding documents of the New Criticism, and most of the eminent New Critics were Richards' students. New Criticism, along with Russian Formalism, sought to change the approach to the study of literature from historical and biographical to analysis of the text itself and the intertextual comparison. In English-speaking countries, New Criticism is generally considered the beginning of modern literary criticism, and Richards is one of the founders of the contemporary study of literature in English. Richards believed in the role that poetry plays in the period of modernism when social and moral authority had come into question. For him, poetry was the place where the balancing of these concerns took place. In this regard, Richards assigns to poetry the place that had traditionally been assigned to mythology, which was mythic thought in poetic form. Richards began his career without formal training in literature; Richards studied philosophy ("moral sciences") at Cambridge University. This may have led to one of Richards' assertions for the shape of literary study in the twentieth century, namely that literary study cannot and should not be undertaken as a specialization in itself, but instead studied alongside a cognate field (philosophy, psychology, rhetoric, etc.). Richards' earliest teaching appointments were in the equivalent of what might be called "adjunct faculty" positions; Magdalene College at Cambridge would not salary Richards to teach the new and untested field of English literature. Instead, Richards collected tuition directly from the students as they entered the classroom each week. He became professor of English at Harvard University in 1939, where he taught for a quarter century. He returned to Cambridge, where he died in 1979 following a teaching trip to China. Richards' life and influence can be divided into periods, which correspond roughly to his intellectual interests. In many of these achievements, Richards found a collaborator in C. K. Ogden. Ogden served as his collaborator on three of the most important projects of Richards' life. In Foundations of Aesthetics (co-authored by Richards, Ogden, and James Woods), Richards maps out the principles of aesthetic reception which lay at the root of Richards' literary theory (the principle of "harmony," or balance of competing psychological impulses). Additionally, the structure of the work (surveying multiple, competing definitions of the term "aesthetic") prefigures his work on multiple definition in Coleridge on Imagination, in Basic Rules of Reason and in Mencius on the Mind. 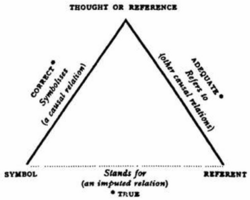 In The Meaning of Meaning: A Study of the Influence of Language upon Thought and of the Science of Symbolism, Richards and Odgen work out the triadic theory of semiotics which, in its dependence on psychological theories, prefigures the importance of psychology in Richards' independently authored literary criticism. Richards' semiotics has been compared to that of Ferdinand de Saussure. Saussure's theory of linguistics distinguished between the symbolic register and the "real world." Language, the symbolic order, is arbitrary, with no inherent meaning in the words themselves. Meaning depends on the relationship to things. Richards' system was a triad that included not only the symbolic and the real, but the conceptual world of mind, which are neither "real" nor merely symbols. Many current semioticians (notably Umberto Eco) salute this work as a vast improvement on the dyadic semiotics of Saussure. Finally, in works such as, The General Basic English Dictionary and Times of India Guide to Basic English, Richards and Ogden developed their most internationally influential project—the Basic English program for the development of an international language based with an 850-word vocabulary. Richards' own travels, especially to China, made him an effective advocate for this international program. At Harvard, he took the next step, integrating new media (television, especially) into his international pedagogy. Richards served as mentor and teacher to other prominent critics. Richards was a contemporary of F. R. Leavis. William Empson studied under Richards at Cambridge before Empson’s banishment. Richards’ influence extended beyond the English critics. His work, particularly his Principles and Practical Criticism, impacted the American critics of the New Criticism as well. His classroom experiments, removing the authorial and contextual information from several literary works to gauge the impact this information had on their interpretation of the works, was one of the influences that led to a new view of criticism. In this experiment, Richards removed recourse to the usual targets of criticism, like authorial intent. By forcing students to simply focus on the words on the page, he helped to create the emphasis on “close reading” and on the formal aspects of the text that had previously been subsumed in the focus on content. This provided some of the impetus for the formalism of New Critics like Cleanth Brooks, John Crowe Ransom, and William K. Wimsatt, among others. Richards was deeply invested in understanding literary interpretation from an individual, psychological perspective. He read deeply in psychological theory of the day, finding the psychological work of Sir Charles Sherrington most useful for his own work. While his theories of poetic interpretation and poetic language have been surpassed, his initial impulses (to ground a theory of interpretation in both the theoretical language of psychology and aesthetic theory, as well as in empirical work) shaped twentieth century literary studies into what it is today. The Foundations of Aesthetics. George Allen and Unwin: London, 1922. Co-authored with C. K. Ogden and James Wood. 2nd edition with revised preface, (Lear Publishers: New York, 1925). Principles of Literary Criticism. Kegan Paul, Trench, Trubner: London, 1924; New York, 1925. Subsequent editions: London, 1926 (with two new appendices), New York, 1926 (Same as London 1926, but with new preface, dated New York, April 1926), 1928 (with rev preface). Science and Poetry. Kegan Paul, Trench, Trubner: London, 1926. A reset edition was published in the same year in New York, by W. W. Norton, 1926. Second edition, revised and enlarged: Kegan Paul, Trench, Trubner: London, 1935. There is no known U.S. publication of the 2nd Edition, however the text of the 1935 edition was reset, with a "Preface," "Commentary," and an additional essay, "How Does a Poem Know When it is Finished" (1963), as Poetries and Sciences. W. W. Norton: New York and London, 1970. Practical Criticism. Kegan Paul, Trench, Trubner: London, 1929. Subsequent editions: 1930 (rev). The Meaning of Meaning: A Study of the Influence of Language upon Thought and of the Science of Symbolism. Co-authored with C. K. Ogden. With an introduction by J. P. Postgate, and supplementary essays by Bronislaw Malinowski, "The Problem of Meaning in Primitive Languages," and F. G. Crookshank, "The Importance of a Theory of Signs and a Critique of Language in the Study of Medicine." London and New York, 1923. Mencius on the Mind: Experiments in Multiple Definition. Kegan Paul, Trench, Trubner & Co.: London; Harcourt, Brace: New York, 1932. Coleridge on Imagination. Kegan Paul, Trench, Trubner: London, 1934; New York, 1935. Later editions: NY and London 1950 (Revised with new preface), Bloomington 1960 (Reprints 1950, with new foreword by Richards and introduction by K. Raine). The Philosophy of Rhetoric. Oxford University Press: New York and London, 1936. Interpretation in Teaching. Routledge & Kegan Paul: London; Harcourt, Brace: New York, 1938. Subsequent editions: 1973 (with '"Retrospect"). Basic in Teaching: East and West. Kegan Paul, Trench, Trubner: London, 1935. How To Read a Page: A Course in Effective Reading, With an Introduction to a Hundred Great Words. W. W. Norton: New York, 1942; Routledge & Kegan Paul: London, 1943. Subsequent editions: 1959 (Beacon Press: Boston. With new 'Introduction'). The Wrath of Achilles: The Iliad of Homer, Shortened and in a New Translation. W. W. Norton: New York, 1950; Routledge & Kegan Paul: London, 1951. ↑ 1.0 1.1 Hazard Adams, Critical Theory Since Plato (Harcourt Brace Jovanovich, Inc., 1971, ISBN 0155161423), 847. Karnani, Chetan. I. A. Richards: A Critical Assessment. Arnold Publishers, 1989. I.A. Richards The Literary Encyclopedia. I. A. Richards Biography Poetry Foundation. History of "I. A. Richards"
This page was last modified on 23 January 2018, at 15:53.